For years, many scientists had thought that plate tectonics existed nowhere in our solar system but on Earth. Now, a UCLA scientist has discovered that the geological phenomenon, which involves the movement of huge crustal plates beneath a planet's surface, also exists on Mars. 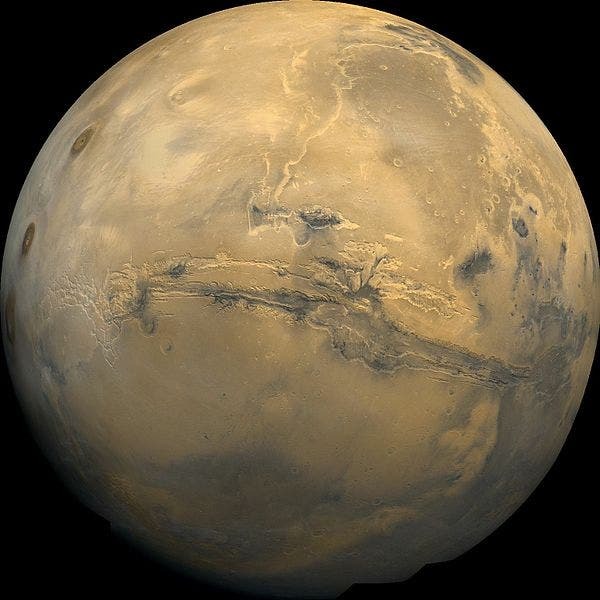 "Mars is at a primitive stage of plate tectonics. It gives us a glimpse of how the early Earth may have looked and may help us understand how plate tectonics began on Earth," said An Yin, a UCLA professor of Earth and space sciences and the sole author of the new research. Yin made the discovery during his analysis of satellite images from a NASA spacecraft known as THEMIS (Time History of Events and Macroscale Interactions during Substorms) and from the HIRISE (High Resolution Imaging Science Experiment) camera on NASA's Mars Reconnaissance Orbiter. He analyzed about 100 satellite images — approximately a dozen were revealing of plate tectonics. Yin has conducted geologic research in the Himalayas and Tibet, where two of the Earth's seven major plates divide. * "When I studied the satellite images from Mars, many of the features looked very much like fault systems I have seen in the Himalayas and Tibet, and in California as well, including the geomorphology," said Yin, a planetary geologist. For example, he saw a very smooth, flat side of a canyon wall, which can be generated only by a fault, and a steep cliff, comparable to cliffs in California's Death Valley, which also are generated by a fault. Mars has a linear volcanic zone, which Yin said is a typical product of plate tectonics. "You don't see these features anywhere else on other planets in our solar system, other than Earth and Mars," said Yin, whose research is featured as the cover story in the August issue of the journal Lithosphere. The surface of Mars contains the longest and deepest system of canyons in our solar system, known as Valles Marineris (image at top and bottom of the page–Latin for Mariner Valleys and named for the Mariner 9 Mars orbiter of 1971, which discovered it). It is nearly 2,500 miles long — about nine times longer than the Earth's Grand Canyon. Scientists have wondered for four decades how it formed. Was it a big crack in Mars' shell that opened up? 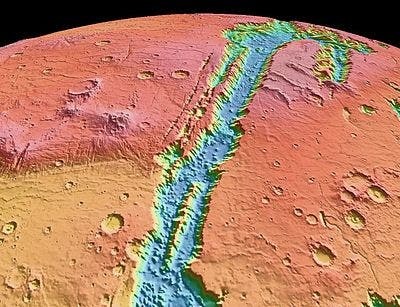 "In the beginning, I did not expect plate tectonics, but the more I studied it, the more I realized Mars is so different from what other scientists anticipated," Yin said. "I saw that the idea that it is just a big crack that opened up is incorrect. It is really a plate boundary, with horizontal motion. That is kind of shocking, but the evidence is quite clear. * "The shell is broken and is moving horizontally over a long distance. It is very similar to the Earth's Dead Sea fault system, which has also opened up and is moving horizontally." The two plates divided by Mars' Valles Marineris have moved approximately 93 miles horizontally relative to each other, Yin said. California's San Andreas Fault, which is over the intersection of two plates, has moved about twice as much — but the Earth is about twice the size of Mars, so Yin said they are comparable. Yin, whose research is partly funded by the National Science Foundation, calls the two plates on Mars the Valles Marineris North and the Valles Marineris South. "Earth has a very broken 'egg shell,' so its surface has many plates; Mars' is slightly broken and may be on the way to becoming very broken, except its pace is very slow due to its small size and, thus, less thermal energy to drive it," Yin said. "This may be the reason Mars has fewer plates than on Earth." Mars has landslides, and Yin said a fault is shifting the landslides, moving them from their source. "I think so," he said. "I think the fault is probably still active, but not every day. It wakes up every once in a while, over a very long duration — perhaps every million years or more." Yin is very confident in his findings, but mysteries remain, he said, including how far beneath the surface the plates are located. * "I don't quite understand why the plates are moving with such a large magnitude or what the rate of movement is; maybe Mars has a different form of plate tectonics," Yin said. The rate is much slower than on Earth. "* The Earth has a broken shell with seven major plates; pieces of the shell move, and one plate may move over another. Yin is doubtful that Mars has more than two plates. "We have been able to identify only the two plates," he said. "For the other areas on Mars, I think the chances are very, very small. I don't see any other major crack." Yin, who will continue to study plate tectonics on Mars, will answer those questions in a follow-up paper that he also plans to publish in the journal Lithosphere. Valles Marineris stretches over 4000 km across Mars, mostly east-west just below the equator, as seen in this Viking 1 orbiter image mosaic below.